Get the Free Vegan Instant Pot Recipes &Tips Newsletter! Summary: We love making soups in the winter. They’re warm, hearty, and help us feel better on a cold evening, especially at the end of a long day. If you’re under the weather, a good soup can nourish you like nothing else on the planet. We recently discovered this black bean tortilla soup at a friend’s holiday party and were so wowed that we begged her for the recipe. She was delighted to share it, and so are we. The concoction only takes about 45 minutes to prepare, so it’s a great dish if you’re on the run. We love making soups in the winter. They’re warm, hearty, and help us feel better on a cold evening, especially at the end of a long day. If you’re under the weather, a good soup can nourish you like nothing else on the planet. We recently discovered this black bean tortilla soup at a friend’s holiday party and were so wowed that we begged her for the recipe. She was delighted to share it, and so are we. The concoction only takes about 45 minutes to prepare, so it’s a great dish if you’re on the run. 1 28-ounce can, stewed tomatoes (check label, make sure no chemicals are added). Pour 1 tablespoon olive oil into a large pan and add chopped onions and garlic. Fry on medium heat until onions and garlic are slightly brown. Your kitchen will smell terrific, and you’re just getting started! Add vegetable broth, stewed tomatoes, both chili powders, salt, and cumin. Simmer for 15-20 minutes until tomatoes are cooked through. Add black beans and corn and continue simmering for 10 minutes until all ingredients are thoroughly combined. Meanwhile, cut tortillas into thin strips. Place strips in olive oil in a medium-sized frying pan (cast iron is great!) Fry strips on both sides until brown and crispy, then remove from pan. Place them on paper towel to absorb excess olive oil. Serve soup in festive bowls with avocado slices, a squeeze or two of lime juice, a liberal dash of cilantro, and as many tortilla strips as your heart desires. 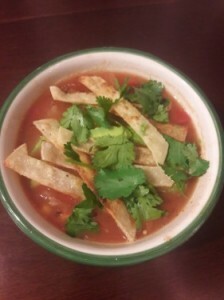 We love tortilla strips and find that it’s hard to put too many into this soup. But eat fast, because they do get soggy. Serves 4-6 hungry guests. This soup is especially good with vegan, gluten-free cornbread and/or beer. If you do end up with leftovers, you can freeze them, or devour them in the next couple of days. You will be utterly delighted by this simple, inexpensive, and satisfying meal. Stay warm and enjoy!